Bo and Tiffany were in town. They came over for dinner on Thursday night, it was so much fun getting to hang out with them! It really made me realize just how much I miss her. 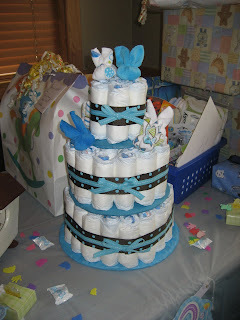 I made a diaper cake for her! I decorated it with some baby wash cloth boo boo bunnies! I also made her a Carolina Tar heels wipes case and some paci clips but I forgot to get a picture! Oh and I also got her a swaddle me blanket because I think that those things are the best invention ever. By far my favorite baby item! 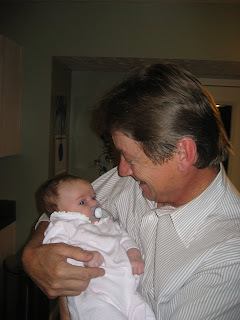 Grandpa Tim arrived late Sunday night! Here he is getting to hold Kenley for the first time! Kenley and I took him to Baker's Square this morning because it is a requirement of anyone who comes to visit us! Auntie Kimbe sent Kenley this cute little outfit! 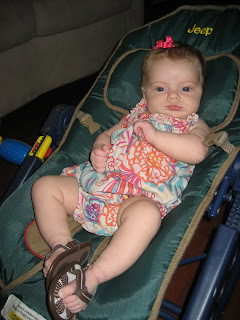 Thanks Auntie Kimbe, Kenley says that she is ready for you to take her to the beach! Notice the cute baby flip flops! I ordered them off of ebay they are Baby Gap and they finally came in the mail yesterday! 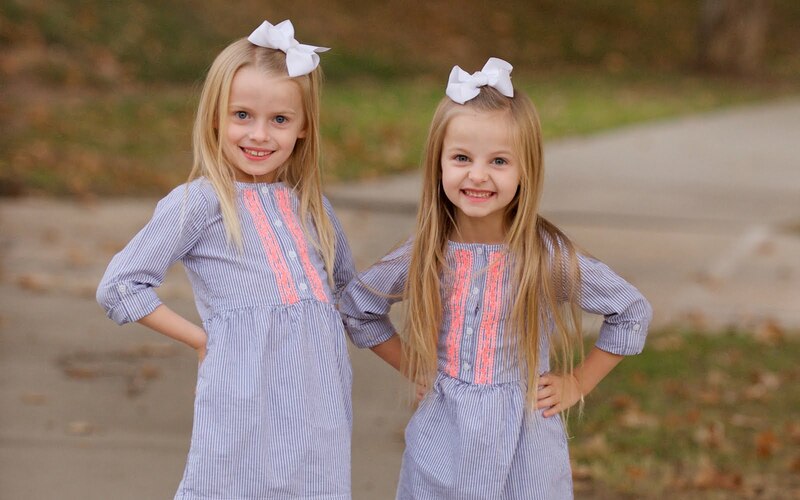 They are so adorable! In other news our friends Maryn and Daniel are now the proud parents of Abigail Violet Good! She was born yesterday evening and weighs in at 5 lbs 12 oz. She is just a tiny little thing! Kenley is so excited that she has another friend! 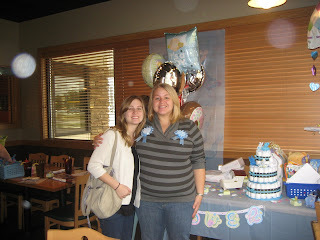 Jenny I cant wait for you to get here! Bakers Square is a must. I cant wait for you to see and hold Kenley now that she is older and has some personality!